Cleaning of Industrial Ultrasonic Cleaner parts always is always worry in industries. Most of the industries are still cleaning the parts by hand scrubbing.. Residue on parts has been removed by rubbing the cleaning solution with the help of brush. The cleaning method is time consuming, waste of manpower, still cleaning is not consistence & not up to the mark. LeelaSonic has developed Ultrasonic Parts Cleaner Ultrasonic Cleaning Equipments in Mumbai Thane for successful cleaning of parts. No more hand and mechanical brushing is needed to remove contaminated with grease, hydraulic oil, rust, grime, carbon, aluminum shavings and material gassing , residual polymer on parts. Used for cleaning industrial parts , nut, bolt, engine filters, aircraft parts, hydraulic filters. Using LeelaSonic Ultrasonic cleaner you can thoroughly clean the parts. This will reduce your manpower in hours & number of person required for parts cleaning process. While cleaning parts in ultrasonic cleaner you will not have to disassemble parts. It will also increase the life of parts. The Two-tank ultrasonic cleaning and rinsing machine designed for lower volumes of parts are cleaned and rinsed manually by operators. A compressed-air Drying Wand is also included to permit operators to dry parts after the rinsing process is complete. 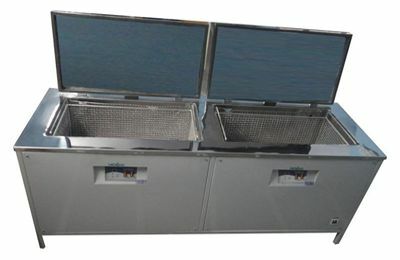 The Leelasonic Two tank ultrasonic cleaning & rinsing machine is manufactured using the highest grade of materials available, and includes features such as stainless steel access panels, and Digital Cycle Timers to increase the longevity of the cleaning agent and system, while simultaneously providing convenient operation. Applications include: refurbishment of computer, photocopier and engine components, maintenance of mould tools, cleaning of extrusion dies, printing components, surgical instruments, electronics assembly system parts and small machine components.